The following is a copy of an article published in the Cash Lovell Stables Riding Academy November 2012 Newsletter. The article, written by owner/operator Parker Lovell, reflects her thoughts on her recent trip with Kybele members to Ghana. Reprinted with permission. A stream of warm sewage ran through the place. And yet, the children’s uniforms, like the beautiful souls wearing them, were clean. Their hair was perfectly tended, their faces lit by excitement and the brilliant white from their eyes and teeth. I laughed, out loud. As for rich, I had to concede, rich meaning having money and many material things, we surely were by comparison. As for beautiful, we stunk, literally. Sweat oozed from our every pore. Dirt and grime clung to the sweat. Jozy’s foot was covered in foul from a creek of sewage through which we tiptoed to reach these children. I hadn’t shaved my legs or under my arms for a week for an absurd fear that I would nick myself and get an infection from the water – contaminated water that we took the most refreshing cold showers in, but water that we couldn’t drink. Water the locals consider liquid gold. It was in this place that I asked myself, who am I really? How can we live in the same world as these children, at the same moment in time, and live such grossly different lives? Man’s inhumanity to man, and man’s humanity to man, on broad display. I went into our week in Ghana exhausted. I had spent three sleepless nights before the trip trying to figure out how to take Cash Lovell Stables into the future — without the man behind the name. I have had to make tough choices during this recent chapter of my life. And there are tough ones still to make. A pale of worried exhaustion hung over me as we set out on this journey. I faked a big smile and we were off. LEFT: The school entrance. | MIDDLE: The new water spigot. Because of your donations, the school has running water. | RIGHT: A plaque inside the slave castle, which is kept open by the government and is open to the public for tours. There is no way in this short space I can explain what we experienced, or how it changed me. If you’re interested, we are working on something we can share soon with all of the people who gave money, items, computers and prayers. Between the 11 of us who made the trip, we carried 1300 pounds of donations, not counting the computers, and we brought home more than 3,000 pictures. The hardest photos for me to review are those of the former slave castle. Maybe it’s because I was there, and smelled the terror embedded in the stone. I felt the ghosts of the African’s ancestors – and my own. The Ghanians we met embraced us. My memory flashes to the peanut soup they shared. A beautiful Ghanaian woman pouring water into an inoperable commode so that we could use. The blackboard where the children learned to type. There wasn’t one keyboard in the entire school. Yet the children had somehow learned to type by memorizing the home keys drawn on a blackboard. A group of children drinking from a community bucket — and then offering us their ladle. Sweet little Mary, who after singing Jesus Loves Me with Cashlyn, produced a coin from God-only-knows-where and tried to give it to Cashlyn. Two-year-old Naomi clinging to Cashlyn’s neck, crying when we had to board our bus. Beautiful Amina reading a letter we brought her from a student here. She clutched the letter to her chest, asking me to come back and read it with her again the next day. LEFT: School restrooms, thanks also to your donations. | MIDDLE: One of several “slave castles” that dot the West African coast. For nearly 300 years, an average of 1,000 Africans a week were dragged from this castle’s dungeons and shipped to Europe and America to work as slaves. | RIGHT: A plaque leading to the female slave dungeons. These, and a thousand other surreal moments, are part of me now. I spent the last two days back in this wonderful land of plenty trying to prepare for our annual barn Christmas party. And it has felt wrong. Cash’s illness has rocked my family’s world, and our business, to the core. But we are still awash in blessings. In Ghana, my head and my heart began to ease. I saw beautiful children playing in a dirt mound outside an outhouse, and they were joyful. In Ghana, I saw no child with an Ipod, or Epud or game box, or whatever they call those maddening things. When we talked to Ghanaian children, they looked us in the eyes. Whether in the schools or markets, on the streets or in the Ghanaian homes we were blessed to visit, we were blown away by these children’s sense of self and manners. They were proud, humble and determined. When we produced a few wooden objects, five bottles of paint, and four bottles of glitter, they were thrilled to create simple art. When we left, there was glitter floating in the sewage stream leading out of the school. The irony was maddening. Given this experience, and my family’s recent struggles, I hope you can understand that I cannot throw an ostentatious Christmas party this year. 1. We cannot afford it. 2. It doesn’t feel right in my bones, even if we could. So here is what I propose instead: Let’s have a different kind of party this year, an old-timey Christmas party, complete with hay rides, pony rides, tire swings, Bluegrass music, tug of war competitions and kickball. We’ll paint faces, hunt for reindeer food, and plan a scavenger hunt. We’ll celebrate our babies and our myriad blessings without all the fancy. We’ll do it in an old barn, a little like the place where Christmas began so many centuries ago. Everyone is invited to bring a few biscuits, or some donuts or cookies to share. But if you don’t want to bring anything, that’s OK too. Just come, sip coffee and juice with us. Lee Lee and the kids are making peanut butter crackers. We will dedicate this year’s Christmas party to our new friends across the Atlantic who taught us so much. LEFT: Cashlyn and friends. | MIDDLE: One of our little friends playing in the school yard. | RIGHT: How we got all this stuff in our suitcases is still a mystery. But we did it, and sorting it out to distribute to the schools was a big, wonderful job. When we announced that we were installing a computer room in one of the Ghanaian schools, we had not computers to install. Not one. And we had no money to purchase them. Forsyth Country Day School (Winston-Salem, NC) learned of our need, and its leaders donated the computers – 10 laptops and 14 desktops. then we had no way of shipping them there. Shipping companies wanted $12,000! People across our community tried to help. At a local football game, a man overheard another man discussing the problem. He introduced himself as Norman Self, and said his company, SOS Global Express Shipping out of New Bern, NC would help. This company shipped the computers for us at an incredibly reduced rate. Not only that, but an owner of SOS Global wrote a personal check to cover $1,000 of the bill. When we didn’t have the money to pay our part of the freight bill, about $1,300, we asked for your help. And this barn was filled with people bringing donations of money. Enough to pay the freight and buy the other items needed. LEFT: Health Room supplies that were given to a school built by the former First Lady of Ghana, whom we met. We were on Ghanaian National TV with her! | MIDDLE: Ray Hawley loading the boxes of computers at the airport in Accra. | RIGHT: Those incredible computers donated by Forsyth Country Day School. It took monumental work from both sides of the Atlantic, especially our new friends at Ghana Health Services. We got them installed and fired up! You can’t imagine, or maybe you can, the kids’ excitement! One of my favorite sayings is, “Let’s just throw it up to God.” We did. Our heartfelt Thank You to Him, and to you all. 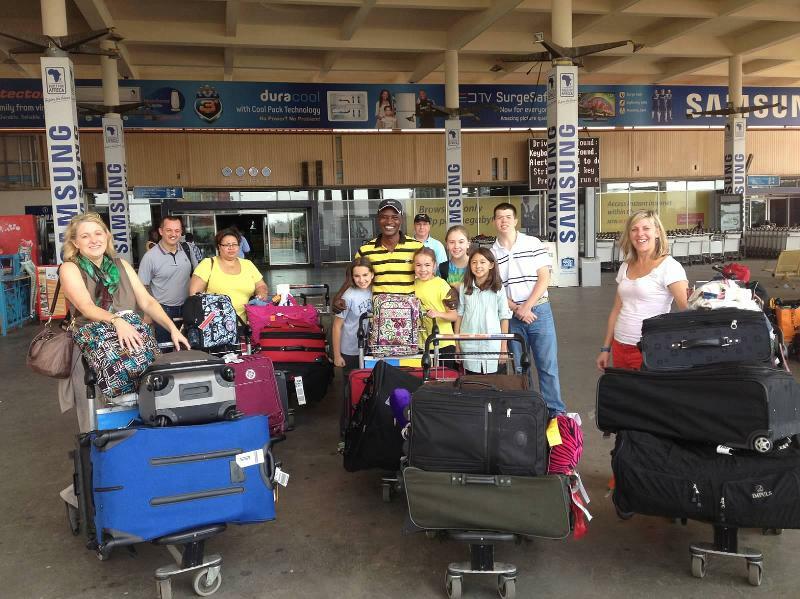 Inside these suitcases is more than 1300 pounds of your donations to help the Ghanaian children! Click HERE to see the list of supplies that were donated. Awesome!